All my free patterns are found on the right side of this blog page. Look to the right, and scroll down, slowly. until you see the label list as pictured below, (it's on the right hand side too). It is actually way longer than pictured below, I took a screen shot of what I could. If you click on any word in the label list, then all the posts with the word will come up for you. Give it a try, it's easy! Visit my Ravelry designer page here. It has my patterns in a gallery view. OR use the search bar on the right side, near the top. One word searches work best. Amigurumi Freely the blog, here. It is my new pattern directory with pattern links from other designers. Pour les lunettes j'utilise du fil de fer et du fil à scoubidou. Le fil scoubidou étant creux, j'insère à l'intérieur le fil de fer, et il n'y a plus qu'à créer la forme voulue. Bravo et merçi pour vos tutos. Hello Thanks for your great patterns. Enjoy them al a lot. I have been crocheting for just a couple of months, and your patterns and tutorials make me look like a pro! I am "hooked!" ;) Thank you so much! You are wonderful! Thanks for the lovely patterns. I explain how to find all my patterns on this very post you left the message on.. scroll up and it's all there. Near the top is a slide show, scroll through that until you see Coraline. 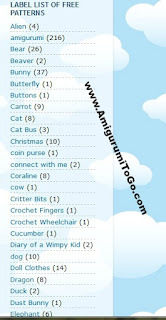 you can look to the right of this page, scroll down a ways and there is a label list... click on the label "Coraline (10)" and all my Coraline patterns will come up for you. The (10) is the number of posts that are under that label. Sharon...I just wanted to thank you for all you do for us!! I started making some of these lil guys and am sooooo hooked now on them!! it seems I Am gravitating more and more to them all!!! TYTYTYTY lady!! you're the best !!! making big foot monkey:) head body and 1 arm complete and im happy at progress. Thank you very much for your patterns. All of them are wonderful!!! Thank you for the tutorials. I finally know how to make a magic circle now. Your explanations are concise and to the point. Thank you for your tutorials, indeed I start hooking since this May. It makes me look like a pro, too! Thank you! I think I see the problem.. there was an ad that stretched across part of the label list so try again. I just shrunk that ad down and now the full label list is viewable. Click on the word or the label "Miniature" and 7 posts will pop up but only a summary of each post so you need to click on "read more" to get the full post. I just love your patterns and your generosity in giving them to us. I just made the pig and have had trouble gluing in the eyes. Can you tell me what type of glue to use that will permanently stick. Hi Sharon, Just wanted to let you know that I finished 16 Amigurumi toys that will go to children at Christmas. They will be distributed by the Salvation Army. I am still working on two more and hope to keep on crocheting until the last minute. Thought you would like to know what is happening with your patterns. Have a lovely Christmas. wow that is so wonderful Dorothy! That just makes me so happy, thank you very much for letting me know. I love your patterns and tutorials. They are so easy to follow. I personalize the ones I do for the people I give them to. They just love them, especially the grandkids. I tell everyone about your tutorials and blogs. The dollhouse was beautiful, I especially like the mushroom character. Many blessings and continued success in the future. Obrigada por compartilhar suas habilidades, agradeço a Deus pela sua vida e peço a Ele que te fortaleça cada dia mais. Que Deus continue te abençoando e cuidando de você é o que peço a Ele. Dearest Sharon, you continue to bless SOO many. Can't believe you could improve monkey but can't wait to start another. I have made two, now have bunny to put together, but got yellow yarn today cuz can't wait to make giraffe. I am on a roll. So glad I read about your FB page headed there after posting this. I go to a Y pool for handicap and there is a girl there that I have learned to love so much. She doesn't speak, walk or anything else, I connect with her eyes and have decided I cannot wait to make her one of your projects. Maybe the giraffe, or like idea about long tail monkey someone shared. Thank you does not begin to express my gratitude for your willingness to not only share your talent but always wanting to improve on what we think is pretty perfect. wow, this is pretty awesome and came at such a great time. I really appreciate your heartfelt message and please know it went straight to my heart and there it will stay. Thank you for taking the time to write. Thank you for wanting to make that beautiful little girl a gift. That means the world to me. Thank you for the patterns and inspirations, Sharon. I love your tutorials! You are so wonderful! Thank you for your patterns. I love your patterns, thanks very much, they are very easy to understand. Hi Sharon , I love your patterns , I have just made my first little animal ever ! I have tried so many times in the past to crochet something and now I have managed it .My little bear has turned out beautifully and I just need to sew it together . Your tutorials are amazing,so easy to follow and perfect for a beginner . Thank you for all the time and love you put into these patterns , they are greatly appreciated. You have the most wonderful tutorials! I can't thank you enough for the free patterns. I also give to hospitals and try to match the animals to a book or inexpensive video and these will make wonderful gifts for any child who is facing a stay in the hospital. (The lion will make a wonderful gift with "The Lion, the Witch and the Wardrobe".) Bless you. Sharon I wanted to send you some heartfelt appreciation - I spend lots of spare time searching for new ami patterns to try (I'm addicted), and I have searched amongst hundreds of free and paid patterns across the internet and Ravelry, Etsy etc. Your patterns are not only free, but are the very best ones to follow - they come out exactly as they should! Although admittedly I'm hopeless at assembly so our house is littered with a macabre collection of deconstructed bears, bunnies and pigs whilst I get around to stitching them up. Just know that your work is fabulous, and accept my genuine thanks for being generous enough to share your expertise with us with your patterns, pictures and videos. Thank you so much for sharing your great patterns. I have been admiring the ami projects but was intimidated until I watched one of your tutorials. I dove right in and I'm having a great time making my first teddy bear. I keep finding more of your patterns and of course, want to make them all! I have been crocheting over 60 years and I found something to be truly excited about. I was 11 yrs old and a lady in the park taught me how to make edging on towels. Thank you for letting me revisit that excitement again. Thanks also for giving so many crocheters the opportunity to create wonderful new projects. I loved your video bear crochet on youtube. I want to say, I do much better with video instructions than written, so I did crochet many items from those videos, but, I have to say, never I had so much clarity, joy, perfection like your video. Thank you very much for that. I did the bear, my next project is a monkey, for which, of course, I will use your video. I loved the patterns. I’ve made several elephant, lions, a cat, and a monkey. I’ve also tried something different with the bear pattern. I’ve made two of the bears by fingers and one with a size C hook. I’m hoping to try more of your pattern. P.S. Someone rewritten the first post I set you. Yes I gave some elephants to mothers to be, but I never sent them to a hospital. I would not be able to do that because I do not wish for some children to get a doll and others not. Thank you for being so kind to the mother's to be. It's an honor you are using my patterns to do that. Hi Sharon, I would love a pattern for a poodle, not too small. I've seen many but can't find one cute enough to bother with...please help. I have a very long to-do list that I'm working my way through. Maybe one day I can but I won't be able to anytime soon. Have a look on ravelry.com you might have some luck find one you like there. I love all the patterns you have.when are you going to show more? on your youtube cannle. How can I reach you to discuss issues I am having with the elephant pattern. I follow your pattern but my truck turns out short and bulky! What am I doing wrong? Help me please. BTW—Thanks for all you do. Your stuff is amazing. I hope to one day be able to crochet half as good as you. hi sharon i'm sharon......just wanted to say your patterns are out of this world thank you so much for your time to do this and share it. i am looking for a dragonfly and all i can find are flat ones i put them on top of small blankets to make a lovey or security blankets and all i can find are flat ones. if you run across any or make one i sure would love to have the pattern. but i need 3d not flat. thank you for your time. and again for your caring enough to share. i'm in my twilight years and can't afford to buy patterns. but do enjoy crochet for something to fill my time. Hi! I love your pages. I have not been well lately, so I`ve had a lot of home. Your instructions have brought me much joy. I can not design myself, but I love crocheting. Thank you so much. Kiitos! First I have to say I am sorry you have been unwell, I hope better days will come soon for you. I am glad to know you are finding joy in my patterns, that really means a lot to me. Kiitos! Happy New Year and happy crocheting! Thank you so much for your free patterns they are adorable and I made the sleepy dragon for my granddaughter she just loves it. Thankyou for your free patterns I just finished the lion, in my grandsons favorite colors, orange body and black mane. He loves it! thank you again. God Bless you! Hi Sharon - I am a big fan,of your patterns and have made quite a few. My question is -how do you deal with the yarn splitting mid stitch. I am using RH comfort and super saver. I love crocheting amigurumi even if the yarn splits. Just a quick question, are your crochet sts. the American or English version. I love the dragons.